Make a grand entrance and highlight the majestic views, elegant garden, exciting entertaining area - the Bifold Double Glazed window is so versatile in its uses, that no matter the occasion, it can transform you home from a peaceful and comfortable domicile, to flamboyant and eccentric abode or even a spacious and durable playground! Bifolds have many applications, and not just commercially, such as in restaurants and cafes, they can be used in residential applications for internal or external purposes. Bifold Double Glazed windows have been in demand because of their stylish full-opening design and great practicality, since their performance with respect to acoustic insulation and thermal efficiency has been highly regarded by specifiers having an acoustic rating of upto 44dB and a u value of 1.8. Consider using bifolds internally, to block out the noise in the kids Games room, while keeping a watchful eye at all times. Alternatively, bifolds can be strategically placed on the balcony, deck or garden to make entertaining easy by having a wide area to enjoy the view, pass food onto the table, and appreciate the space you create. View our range of Bifold Double Glazed Windows and Doors in the gallery page -discover their potential, imagine the difference of space and light they will make in your home and become inspired to make your home more comfortable and stylish. This double glazed window combination consists of three double glazed panels, with all double glazed panels opening on the left. 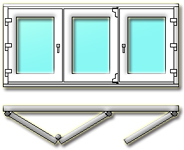 The bifold double glazed window combination can be reversed in direction (left or right), or used as opening in, instead of opening out. This window is appropriate to use for aperture size from a minimum of 1500mm to a maximum of 2700mm in width. If the sizes of your intended double glazed application exceed this, then consider another bifold combination that accommodates your sizes. All bifold double glazed windows and doors can be produced as top hung or bottom hung, according to customer needs. This double glazed window combination consists of three double glazed panels, with two double glazed panels opening on the left and the remaining panel on the opposite side - right. 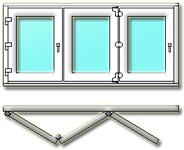 The bifold double glazed window combination can be reversed in direction (left or right) or used as opening in, instead of opening out. This window is appropriate to use for opening size from a minimum 1500mm to a maximum of 2700mm in width. If the sizes of your intended double glazed application exceed this, then consider another bifold combination that accommodates your sizes. All bifold double glazed windows and doors can be produced as top hung or bottom hung, according to customer needs. This double glazed window combination consists of four double glazed panels, with three double glazed panels opening on the left and the remaining panel on the opposite side - right. The bifold double glazed window combination can be reversed in direction (left or right) or used as opening in, instead of opening out. 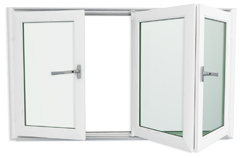 This window is appropriate to use for opening size from a minimum 2000mm to a maximum of 3600mm in width. If the sizes of your intended double glazed application exceed this, then consider another bifold combination that accommodates your sizes. All bifold double glazed windows and doors can be produced as top hung or bottom hung, according to customer needs. This double glazed window combination consists of five double glazed panels, with all five double glazed panels opening on the left. The bifold double glazed window combination can be reversed in direction (left or right) or used as opening in, instead of opening out. This window is appropriate to use for opening size from a minimum 2500mm to a maximum of 4500mm in width. If the sizes of your intended double glazed application exceed this, then consider another bifold combination that accommodates your sizes. All bifold double glazed windows and doors can be produced as top hung or bottom hung, according to customer needs. This double glazed window combination consists of five double glazed panels, with first three double glazed panels opening on the left and the remaining two panels on the opposite side - right. 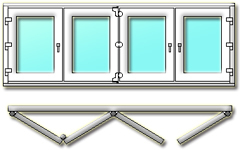 The bifold double glazed window combination can be reversed in direction (left or right) or used as opening in, instead of opening out. This window is appropriate to use for opening size from a minimum 2500mm to a maximum of 4500mm in width. If the sizes of your intended double glazed application exceed this, then consider another bifold combination that accommodates your sizes. All bifold double glazed windows and doors can be produced as top hung or bottom hung, according to customer needs. This double glazed window combination consists of five double glazed panels, with four double glazed panels opening on the left and the remaining panel on the opposite side - right. 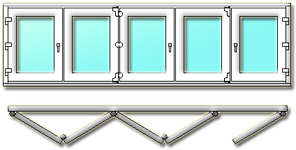 The bifold double glazed window combination can be reversed in direction (left or right) or used as opening in, instead of opening out. This window is appropriate to use for opening size from a minimum 2500mm to a maximum of 4500mm in width. If the sizes of your intended double glazed application exceed this, then consider another bifold combination that accommodates your sizes. All bifold double glazed windows and doors can be produced as top hung or bottom hung, according to customer needs. This double glazed window combination consists of six double glazed panels, with three double glazed panels opening on the left and the remaining three panels on the opposite side - right. 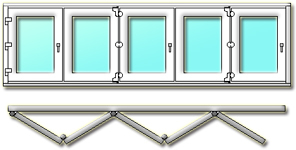 The bifold double glazed window combination can be reversed in direction (left or right) or used as opening in, instead of opening out. This window is appropriate to use for opening size from a minimum 3000mm to a maximum of 5400mm in width. If the sizes of your intended double glazed application exceed this, then consider another bifold combination that accommodates your sizes. All bifold double glazed windows and doors can be produced as top hung or bottom hung, according to customer needs. This double glazed window combination consists of six double glazed panels, with five double glazed panels opening on the left and the remaining panel on the opposite side - right. The bifold double glazed window combination can be reversed in direction (left or right) or used as opening in, instead of opening out. This window is appropriate to use for opening size from a minimum 3000mm to a maximum of 5400mm in width. If the sizes of your intended double glazed application exceed this, then consider another bifold combination that accommodates your sizes. All bifold double glazed windows and doors can be produced as top hung or bottom hung, according to customer needs. Operational tests are carried out on the handles on the bifold windows itself. This means that, not just the function, but also the durability of the attachment between hardware and window is tested thoroughly. They are given the equivalent of 50 operational cycles a day over a period of 10 years. 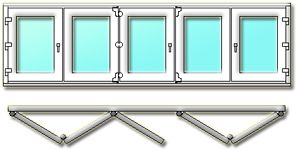 Neither the bifold windows handle itself, or any part of it, must become loose during the course of the test. This ensures the components Double Glazed Windows and Doors use perform consistenly well, so that our customers enjoy a trouble free use of their windows!